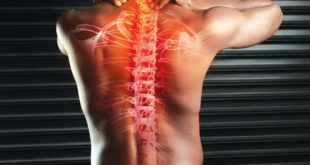 The purpose of radiofrequency (RF) rhizotomy, also known as RF neurotomy or ablation, is to reduce or eliminate facet joint pain (arthritis) and related symptoms in the neck, mid back or low back. The goal of the procedure is to interrupt communication of pain between a specific medial nerve root and the brain. The medial nerve roots innervate the spine’s facet joints. This is how we feel this pain. Before a RF rhizotomy is performed, the pain generating facet joint nerves have been identified by means of a diagnostic injection, such as a facet joint or medial branch nerve block. Other tests may include MRI. Since the medial branch nerves do not control neck or low back muscles, it is not harmful to disrupt or turn off their ability to send signals to the brain conceived as pain. RF ablation is a precisely targeted injection that works by creating energy to destroy a facet joint’s medial branch nerve. Relief from pain and related symptoms may last a year or longer. However, the medial branch nerve root regenerates (grows back) and facet joint pain may come back in years time. Results vary from patient to patient. For example, if there is instability at the segment where the RF neurotomy is performed, pain relief and its duration is less. Each vertebra in the cervical (neck), thoracic (chest), and lumbar (low back) has two sets of facet joints at the back of the spine. One pair faces upward and one downward with a joint on the left and right sides of the vertebra. Facet joints are hinge-like and link vertebrae together. Each facet joint is innervated by a medial branch nerve. The medial branch nerves control sensation to the facet joint. These nerves DO NOT control sensations or muscles in your arms or legs and therefore are safe to treat. The procedure is performed in a sterile setting similar to an outpatient procedure suite. Your injection site is cleaned and draped. Skin numbing medication is injected and given time to take effect. Dr. Rosenblatt uses fluoroscopic guidance (real time x-ray) to guide the needle electrode beside the medial branch nerve. Through the electrode, mild electrical current (radiofrequency) stimulates the medial branch nerve. 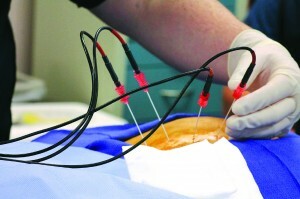 As the electrode is energized, the nerve is changed so the patient’s arthritic spine pain will improve. After the procedure, the patient is moved to the recovery area where our medical staff continues to monitor you if needed. You may be discharged home following your RF ablation. Our medical staff provides you with written aftercare and home instructions. In Dr. Rosenblatt’s beautiful freestanding interventional pain management building in Delray Beach, FL, thousands of individuals have been able to benefit from this technique. Dr. Rosenblatt has been performing this procedure for more than 15 years with great success. Please look forward to more articles about Dr. Aaron Rosenblatt and the vast number of procedures he performs to help people with all types of pain. His main focus is to help individuals avoid surgery, eliminate pain medications and to ultimately feel much better on a daily basis and enjoy life!